Developed through years of advanced chemical research, the Cu+2 Copper Remover™ is the patented copper remover that surpasses the rigorous demands of today’s top shooters and cleans copper fouling faster than traditional petro-ammonia based solvents. 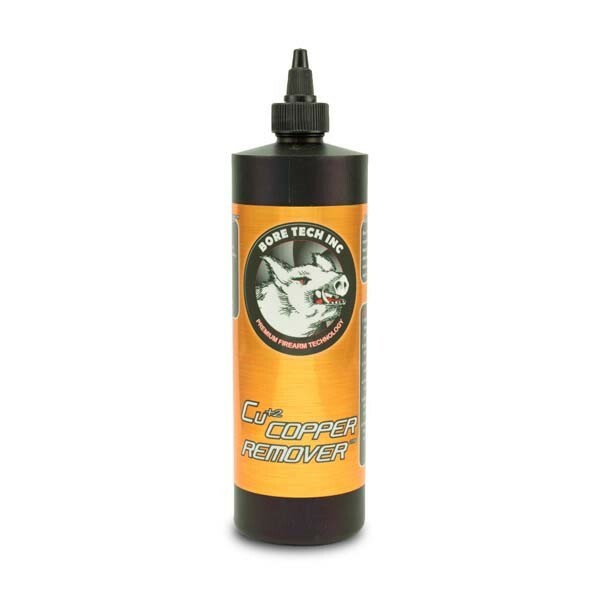 Cu+2 Copper Remover’s proprietary formulation and cleaning process is designed for one thing; continued, rapid and complete extraction of all copper fouling in your firearm’s bore. The key to the Cu+2 Copper Remover’s unparalleled copper removing capabilities is an industry unique two step process. In the first step, the Cu+2 Copper Remover rapidly oxidizes and breaks down copper fouling by reconfiguring its electronic state. Once the copper fouling is oxidized in step one, a specially enhanced binding agent within the Cu+2 Copper Remover’s formulation acts like a magnet capturing the copper and rendering it unable to redeposit in the firearms bore. This exclusive technology allows for the complete extraction of copper fouling at full strength without becoming saturated and losing effectiveness. Bore Tech Cu+2 Copper Remover is 100% ammonia free and barrel safe. It will not etch or harm barrel steels and can be safely left to soak in the bore for an infinite period of time. In addition, the Cu+2 Copper Remover also contains a short term rust preventative, which shields and conditions the firearm’s bore after cleaning. Just dampen your last patch with Cu+2 Copper Remover and your bore will be protected against rust and corrosion for up to 2 weeks. Simply put, Bore Tech’s Cu+2 Copper Remover works faster and better without the fear of barrel damage and the dreadful ammonia smell. After years of trying, this is the copper remover you’ll be buying. 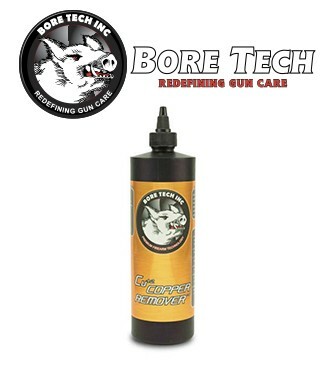 Are your firearms Bore Tech Cu+2 Copper Remover clean?